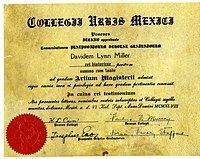 ↑ "Diploma". Oxford Living Dictionaries. Oxford University Press. Retrieved 18 January 2016. ↑ "Diplomatic". Oxford Living Dictionaries. Oxford University Press. Retrieved 18 January 2016. ↑ "Diplomat". Oxford Living Dictionaries. Oxford University Press. Retrieved 18 January 2016. ↑ "Diplomacy". Oxford Living Dictionaries. Oxford University Press. Retrieved 18 January 2016. ↑ "Testamur". Collins Dictionary. Retrieved 18 January 2016. ↑ "Testamur (degree certificates)". Monash University. Retrieved 18 January 2016. ↑ "My Graduation Certificate". University of Melbourne. Retrieved 18 January 2016. ↑ "Testamur (certificate)". University of Wollongong. Retrieved 18 January 2016. ↑ "Parchment". Merriam-Webster. Retrieved 18 January 2016. ↑ "International Baccalaureate Diploma Programme". Retrieved 2007-05-08.